1st of all, this ‘FREE Monte Carlo Trading Spreadsheet’ isn’t ground-breaking in anyway, although the ‘Horizontal Frequency Distribution Graph’ I’ve managed to incorporate (Thank you again Teylyn) in this Excel Trading Spreadsheet isn’t something I’ve seen anywhere else; well, not depicted or formatted this way at least. 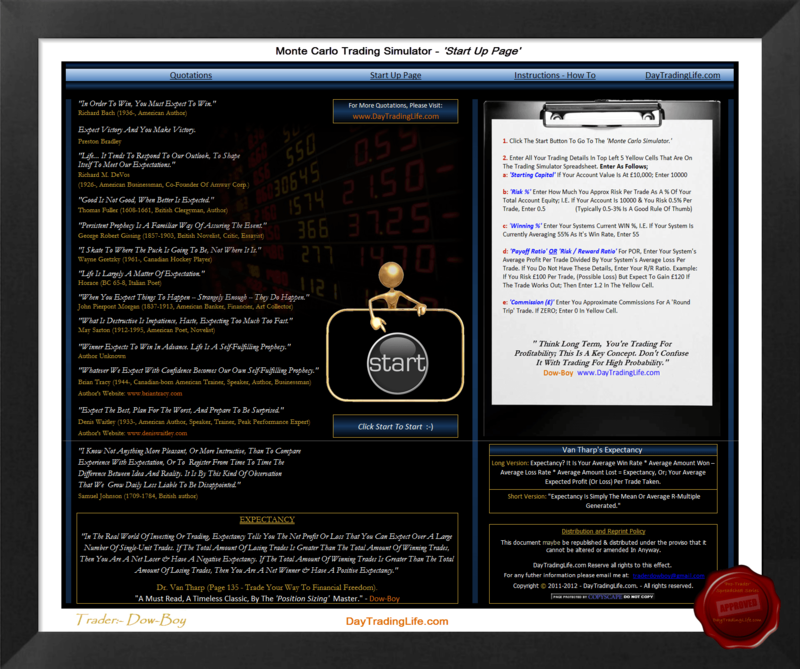 There are some very good shareware ‘Trading Simulators’ available & most trading software platforms incorporate some kind of trading simulation functionality for backtesting & forward test modelling to evaluate your prospective & current trading systems with many ways to adjust parameters to optimise & vary performance results. 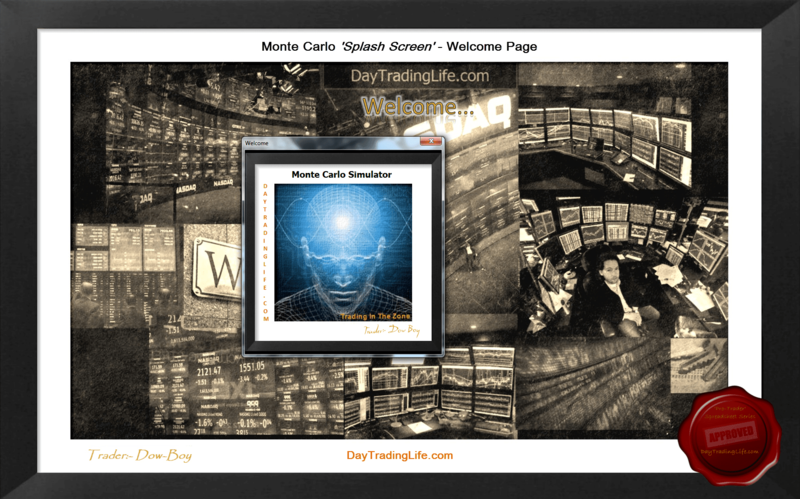 Here’s just 1 link to an off the shelf trading simulator; namely the ‘Zen Monte Carlo Simulator’ by a rather clever man by the name of Volker Butzlaff. As a note, one nice feature of this software is the (data scrambling) functionality concerning the generation of synthetic price data on basis of original historical data (EOD, Intraday etc.) Worth taking a look. Van Tharp & ‘R’ Multiples. It’s almost impossible to speak about trading in relation to risk & position sizing without mentioning the demigod in this field; probably the leading expert in position sizing & money management; namely Dr.Van Tharp Ph.D. His very useful concept of R, R-Multiples & Trade Expectancy. I don’t feel the need; nor am I trying to reinvent the wheel here; so here’s a link to Dr. Van Tharp’s explanation of what ‘Expectancy’ is. I’d rather lead you here than just repeat or paraphrase his explanation. Dr. Van Tharp; (page 135 – Trade Your Way To Financial Freedom). 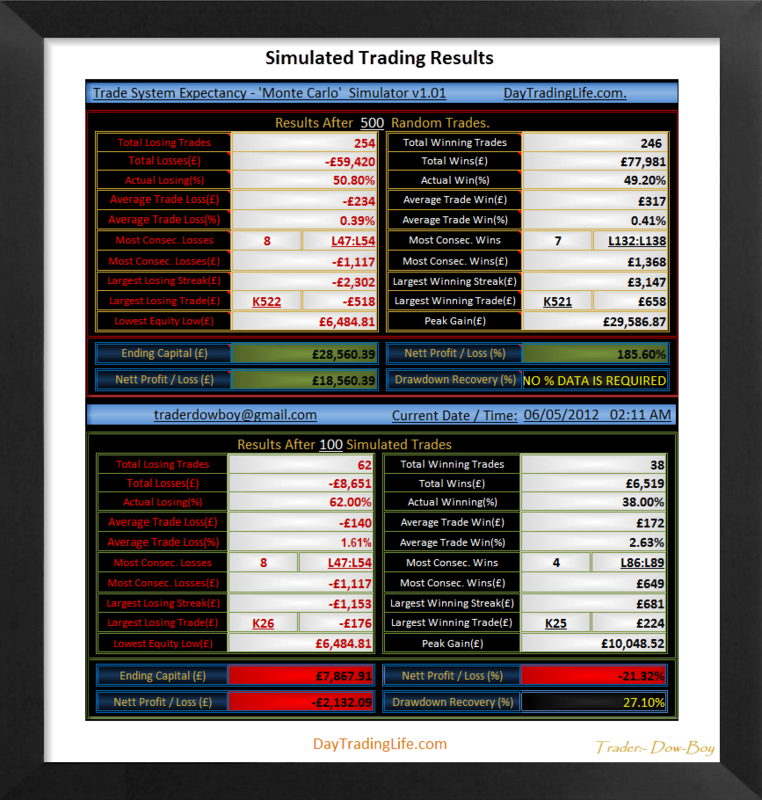 I would like to point out that my ‘Monte Carlo Trading Simulator’ generates results using a constant ‘R’ for all trades. All winning trades are derived from a consistent risk % per trade that never varies. All Losses are also derived from the same % of initial risk. ‘User Defined Trading Metrics’ mentioned earlier. So, this doesn’t show the random variations in returns that a real life trading scenario would. So the significance of ‘R’ as an evaluation metric or KPI to compare the performance of 1 trade against another is really non-applicable here. ‘R’ & Multiples or ‘R’ are extremely important; their true value being in quantifying, evaluating & ultimately being able to compare each of your trades against one another. This then leads onto ‘R-Multiples’ telling you the efficiency of your system; pen ultimately the ‘Expectancy’ of your system over ‘x’ amount of trades. 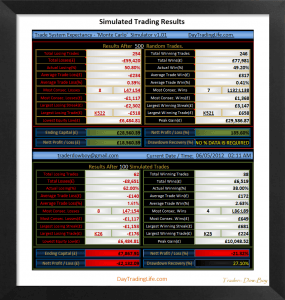 Why I Created These Trading Simulator Spreadsheets? The reason I created this trading spreadsheet? Really it was to aid traders via immersive interaction; induce & cultivate a mindset that’s geared NOT towards a winning & losing mentality, but one that nurtures & promotes a state of mind that’s founded within the concept of positive expectancies. 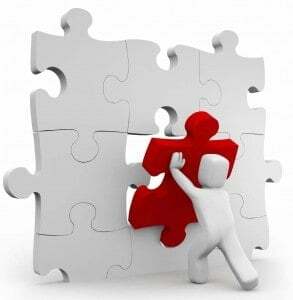 So; thinking & trading in terms of risk reward ratios, trading with objectivity; seeking a positive expectancy as an end result; one must trade whilst holding in the mind’s eye a larger/ bigger picture of trading success. Trading success cannot be obtained trading from a constant macro perspective. It’s trading from multiple perspectives that encompass thinking in terms of PROFITABILITY. I suspect some of you, if not all of you were expecting me to say “You Must Trade In Terms Of Probabilities.” You seek a ‘Positive Expectancy’ that within a ‘basket’ of trades over ‘x’ amount of time you are a net winner. You trade for PROFITABILITY over the long run, which means trading to predetermined objectives that envision a positive expectancy. Trading is about having a profitable system; a trading system that has a positive expectancy over the long run. Having a high win rate usually is associated with small profits (& usually large losses). The best trading systems are quite often a little over break even on win rate %. Seek positive expectancy in your trading system. Trade for profitability defined & aligned by your objectives. 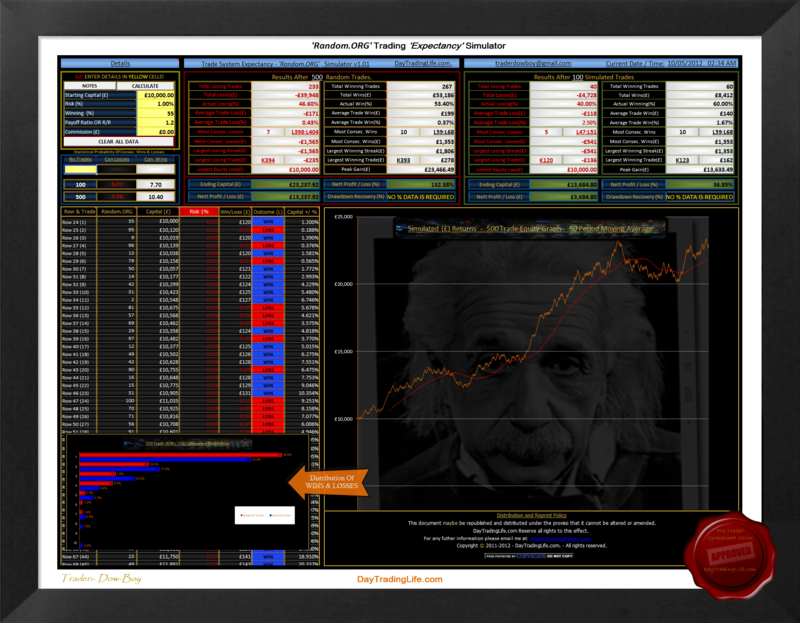 Probability does play a role within actualized trading; but its governor is PROFITABILITY! (Random.ORG Spreadsheet UPDATED 13/07/2017, now working again. FIX – Coding changed in VBA in how the spreadsheet requests data via HTTP Server request). There are 3 different versions to download. The only variable being in how the random numbers are generated. The ‘Monte Carlo’ version uses the Excel inbuilt ‘RAND()’ function. Finally; the ‘Random.ORG’ version. A very nifty import utility (courtesy of Norie; Excel Coding GURU) that allows the import of Random.ORG random numbers. 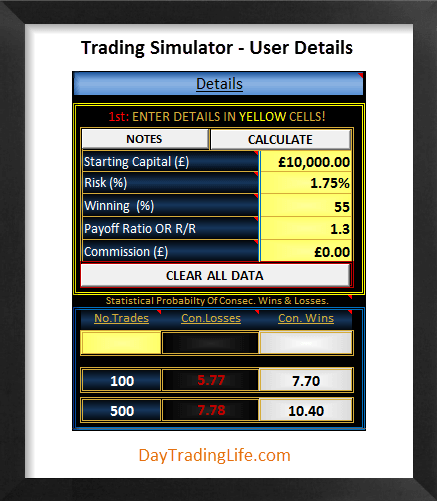 A few features worth mentioning that I’ve managed to integrate within all 3 of these Trading ‘Expectancy’ Simulators. A frequency Distribution Graph, that I haven’t seen elsewhere depicted this way in excel format. (Thanks again Teyln). A ‘Statistical Probability’ of Consecutive WINS & LOSSES table-with a custom user input. Most Consecutive Wins & Losses (Numerical & £’s amount). Largest Losing Streak Results (£’s). 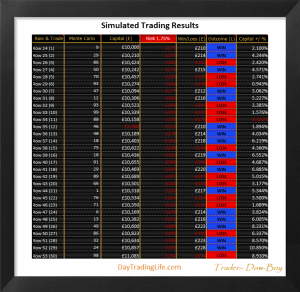 Largest Losing Trade (£’s) & its cell reference-location within the 500 random trading simulation. Total Wins & Total Losses (Numerical & £’s). 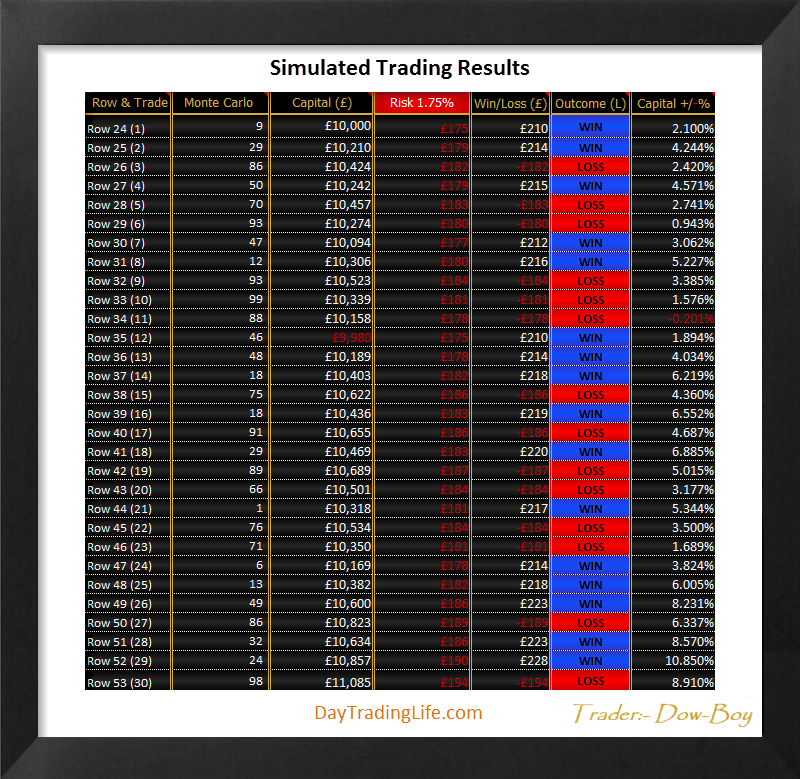 Average Trade Win & Loss In (£’s) & as a (%). As mentioned before; there is nothing groundbreaking here; & you can view ALL the code within ALL these FREE Trading Spreadsheets. I purposely haven’t password protected any part of these trading excel spreadsheets. This might aid/push some of you to try & ‘tweak’ or create your own versions; BE CREATIVE! In Malcolm Gladwell’s book ‘Outliers’ Gladwell submits that it takes 10,000 hours of commitment to become highly successful in any endeavour. K. Anders Ericsson in his book ‘The Road To Excellence,’ estimates a figure of 10 years. Why is this important, & what has this got to do with Trading Simulation? 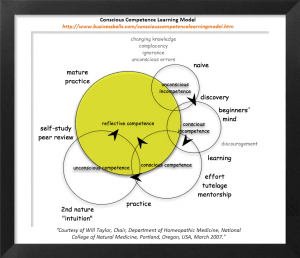 I mention competence as this is the partner; & an essential ingredient to Super Trade. Partner to what you might question? If Super Trading IS 100% psychological, how does psychology play its part when using a trading simulator? 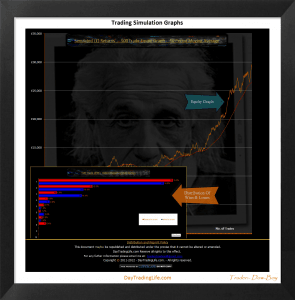 Can you handle PSYCHOLOGICALLY the trading simulator’s projected drawdown figure? Can you handle PSYCHOLOGICALLY the strings/clusters of losses over time? Can you handle PSYCHOLOGICALLY a moderate (example: 50%) Win Rate; knowing you are wrong 50% of the time? Are you PSYCHOLOGICALLY disciplined to consistently stick to a pre-determined Risk allocation %, even after a string of losses? Can you PSYCHOLOGICALLY adhere to your system in different market conditions? Pareto gave us the 80/20 Rule. So; ‘Pareto Style,’ what can I give you in a nutshell that will give you the most bang for your buck regarding these Trading Simulation Spreadsheets? ALLWAYS Trade with Pre-determined OBJECTIVES. Thus try seeking parameters within these ‘Expectancy’ Simulators that will match & be congruent with your trading OBJECTIVES. UNDERSTAND Position sizing; your allocation of RISK in £’s per trade to meet your OBJECTIVES. It’s Critical. FREQUENCY. Be aware that having a desired (£) amount to attain whilst integrating correct position sizing can only be achieved if you have enough trades to meet your desired (£) outcome. The FREQUENCY of your trades plays a huge role in how quickly you can obtain your desired outcome. Look for a strategy (Or combine strategies) that generate enough buy/sell signals that will realize your goals over time. #Side Note: Something I’d like to mention as it does crop up a lot, namely ‘Gamblers Fallacy.’ A common ‘Belief’ is that after a string of losing trades, your odds of winning on the next trade seems more probable, a regression to the mean; so you should increase your position size on the next trade. (MARTINGALE). The implication here is that the probability of winning each trade is somehow influenced by the result of the previous trades. Not true for coin tossing & most other random events. Coins have no memory of what side came up last. Each toss is totally independent of the previous one. Proponents of ‘Martingale Strategies argue that in real trading, each trade isn’t independent of the previous trade. Example: If you trade a breakout system, maybe after several failures success is more likely. The problem is, We Don’t Know in advance which trial will benefit from increased size. So increasing position size could leave you with a large loss; especially if you are increasing your risk per trade as your account is reducing in (£) value. 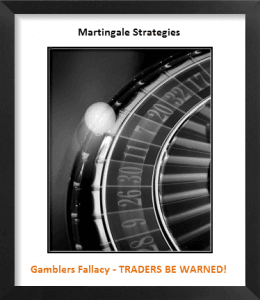 Whilst you can conceptualize where Larry is coming from with his ‘Winning Probability’ idea, Martingale strategies are potentially very dangerous if used consistently as a longer term position sizing strategy. I’m not talking here amount ‘Averaging’ in on a trade incrementally. What Larry is saying is; if you lose say 4 times in a row, your 5th trade is way in your favour to be a winner.” POTENTIALLY VERY DANGEROUS, IF NOT DISASTROUS. Please; don’t fall foul to this methodology. #Also Note: My trading simulator spreadsheets have an integral ‘Statistical Probability Win/Loss Calculator, so you can see statistically how many winners or losers in a row you can expect over the 500 random simulated trades, or a user defined number of trades, taking into account your win rate. This is important because if you have a system with a win rate that is little over break even, you could potentially expect to have a large number of losses in a row, (which my expectancy calculator would depict). If you were using a Martingale strategy as your account equity decreased, this could be catastrophic. The words “Margin Call” comes to mind! ‘Martingale’ Strategies For Trading Are Dangerous-They Just Don’t Work. ‘Anti-Martingale’ Strategies Are NOT Dangerous & Do Work –IF Implemented Correctly! 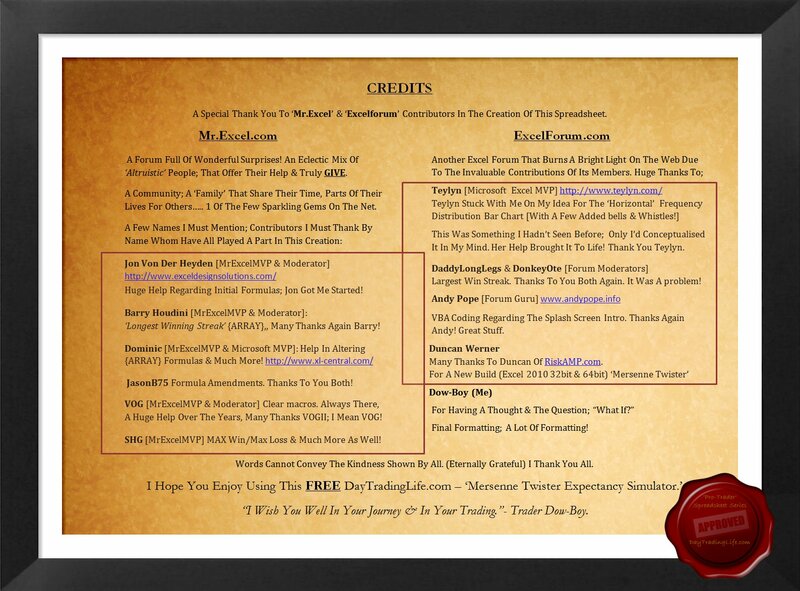 Page 285 – Trade Your Way To Financial Freedom. – Dr.Van Tharp, PhD. “Envision in your mind’s eye an artist; one of the greats. 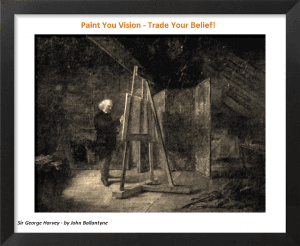 He’s standing in front of his easel that’s gently cradling his canvas; his vision. He’s totally engaged; in a ‘FLOW’ state; nurturing his creative process. His brush commands his right hand; an extension of his mind. His palette is awash with his unique concept of colours that await in his left. His canvas; his vision requires depth to convey greater clarity; to crystallize his perspective. A Trading Simulator is but 1 colour in your palette of trading tools that can be accessed at any time to enhance & illuminate your ideal canvas. This 1 ‘colouring’ tool might seem at 1st glance to play a small part in your ‘artwork;’ but importantly it can ‘Change Your Perspective’ in how you view your future outcomes. Used wisely, a trading simulator helps paint a different picture that can instigate a new positive belief; & We Trade Our Beliefs! “The way we lead our lives is a direct result of how we view the future. 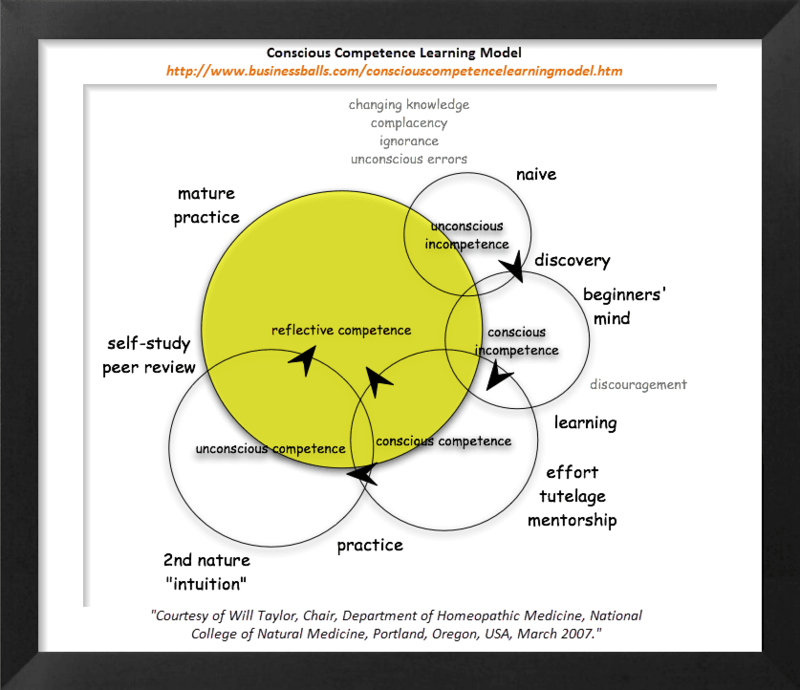 Learn In Time To Master Thy Self! Copyright © – DayTradingLife.com – 2019 – All Rights Reserved. Not what I was expecting but awesome anyway! Nice one! Stumbling across the work you have put up for free has been inspiring. Thank you for what you have shared!